BUFFALO, N.Y.—Faith is of the utmost importance to Ms. Naghan Ar-Rawi, a librarian from Iraq who sought asylum in Malaysia before moving to Buffalo, New York, less than a year ago. To her, it is as important as life. Yet in Shen Yun Performing Arts, faith was revealed to her in a way that broadened her view of the concept. “It is new for me,” Ms. Ar-Rawi said at the Shea’s Performing Arts Center on April 23. She came with her daughter Lujain, and Lujain’s aunt. “Seeing that performance brings another dimension to the whole theme, the whole theme of believing in God,” she said. In Shen Yun, dancers and musicians seek to bring the authentic traditional culture to life. It is a culture that once believed in harmony between heaven, earth, and humankind. “To imagine the idea of divine and heaven and faith, it’s a very noble thing,” Ms. Ar-Rawi said. Shen Yun’s program hints to us that the divine is present throughout China’s 5,000 years of civilization. The opening performance shows the Creator in the heavens, and in just four minutes, with the use of an animated backdrop and dozens of different costumes from heavenly regalia to Han Dynasty court dress, brings the audience to China’s first golden age with a telling of the beginning of China’s divinely inspired culture. In the legend and the historical snippets that follow, there is always a touch of the divine. The live music of an orchestra blending East and West brought her peace, the classical Chinese dance was beautiful, and the lyrics of the bel canto vocalists showed her strength. The vocalists’ voices were strong, and their words were full of faith, she said. “I appreciate that they are having this theme, carrying it all over the world, asking people to be faithful, asking people to enjoy the grace with what they are living [with] here, the grace of gods,” Ms. Ar-Rawi said. For Ms. Ar-Rawi, faith is the most important thing in the world. “Faith is our shield and it’s our mercy, and it’s our life,” she said. New York-based Shen Yun allowed her to see that for thousands of years, people in China experienced what she regards precious as their day to day lives. 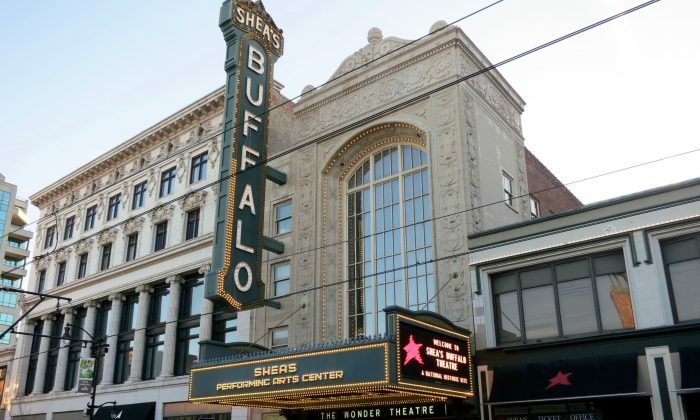 “I hope [Shen Yun] will keep coming every year to Buffalo,” Ms. Ar-Rawi said.